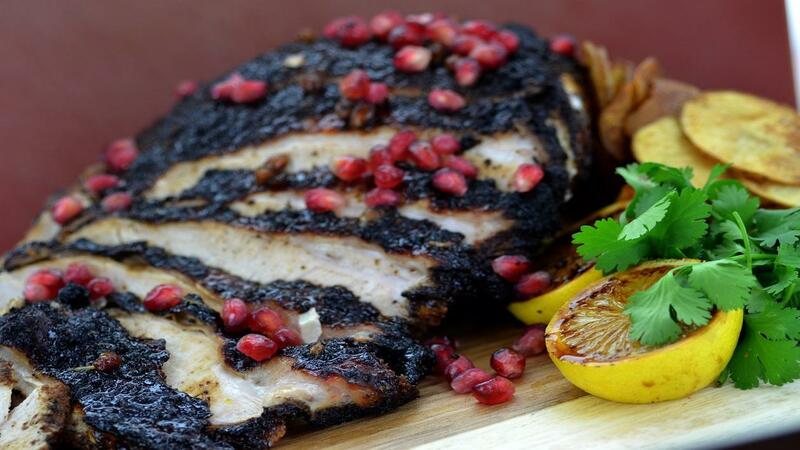 This Persian turkey helps you bring in some variety in your menu. The recipe uses Sumac which is a tangy, lemony spice often used in Mediterranean and Middle Eastern cooking and brings in a twist to the traditional festive roast. Mix all the dry spices and thyme together then rub in to the turkey. Heat the oil then carefully add the turkey. Seal the turkey for 3 -4 min. on both sides then place in to a roasting tray. Bring the water and pomegranate juice to the boil and whisk in the KNORR Chicken Jelly Bouillon. Allow to reduce by half then add in the honey. Pour over the turkey and cook for 50 min. to 1 hour or until cooked through. Remove the turkey from the oven then take out of the tray and cover with tine foil. Allow to rest for 30 min. Pour the cooking liquor into a saucepan and reduce by a third then add half the pomegranate seeds. Carve the turkey in to thin slices then drizzle over the cooking liquor. Sprinkle over the remaining pomegranate seeds and serve.